Madix understands the needs of supercenters. 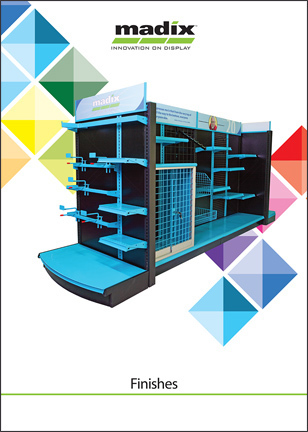 A leading innovator in the store fixture industry, Madix has a history of successfully helping supercenters solve their merchandising challenges. For retailers who carry merchandise in virtually every category, Madix offers the most complete fixture lines in the industry. Each department becomes a miniature store within a store, allowing retailers to maintain individualized branding under one roof. Beyond the assortment of cataloged products, Madix offers the resources to design custom fixturing that answers a customer's specific need. Utilize Madix's fixtures to deter shrinkage, display seasonal items, encourage impulse buys, and promote cross sales. Create the ultimate in-store experience with Madix's unique shopper marketing solutions. Utilizing Madix's displays, retailers improve sales, encouraging shoppers to try new products and discover new merchandise. Utilize print and digital signage to add color, sound, and life to your displays. Dress up ordinary fixtures with new finishes that complement the in-store experience that you are creating.